All it took was two consecutive shots by Totino-Grace forward Xavier Fust and he turned a 2-1 deficit into a 3-2 lead. 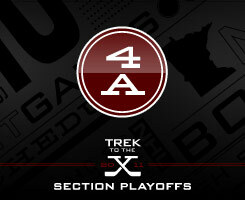 Down by one goal in the Section 4A semi finals on Tuesday, March 1 at Aldrich Arena, No. 2 seed Totino-Grace got a goal with 1 minute, 24 seconds left in the second period to tie the game. After having one goal waived off because South St. Paul goalie Luke Palmquist knocked the net off the moorings and potentially another one because the referees blew the action dead because of a crease violation, Fust buried a one-timer and helped in signaling that the puck did in fact go in. Just 23 seconds into the third, Fust unloaded a heavy wrist shot, that appeared to deflect off a Packers player and over the shoulder of Palmquist for a 3-2 Eagles lead. It just isn’t Fust’s scoring ability that can drive the opposition crazy. He quarterbacks the power play and is not going to always be a shoot first player. With the game still in balance, a 3-2 Eagles lead, Fust found his teammate T.J. Roo and delivered a picture-perfect pass where all Roo had to do was put his stick on it somehow and it would finds its way into the net. Roo just kept his stick on the ice, the puck hit and Totino-Grace was up 4-2. “We knew once they got up two it was going to be an uphill battle” Packers coach Jeff Lagoo said. Fust would lead his Eagles team to victory by that score and are one game away from heading back to the state tournament. That Friday night is the Section 4A final scheduled for 7 p.m., Friday, March 4 at Aldrich Arena against No. 1 seed St. Thomas Academy, a team Totino-Grace lost to 6-0 on Feb. 1. Not only did the Packers play tough, they even had a lead when John Frid’s wrist shot got by Eagles going Nick DeMuth’s glove. This is when Fust took over. He attempted two shots on goal in a gametime span of 1 minute, 47 seconds and gave Totino-Grace the lead it would not relinquish. T.J. Roo of Totino-Grace added some much needed insurance with a tip-in goal, on a pass from Fust late in the third on a power play. Roo also assisted on both of Fust’s goals to give him a three-point night, too. The win puts the Eagles in the Section 4A finals against STA 7 p.m. Friday, March 4 at Aldrich Arena. Fust and the Eagles are going to be underdogs going in, but is something the team is ready for. Xavier Fust scored two goals and had an assist for Totino-Grace as it advances to the Section 4A finals with a 4-2 win against South St. Paul on March 1 at Aldrich Arena. T.J. Roo had a goal and two assists for the Eagles as well. Packers' goalie Luke Palmquist made 41 saves in the losing effort. Jeff Daugherty scored the first for the Eagles in the first, chipping in a loose puck in front of South St. Paul's net. The score stayed that way heading into the second period. South St. Paul got on the board when Jake Schwantes scored in close quarters by the net. John Frid put the Packers ahead when he fired a shot that got through the five-hole of Eagles' goalie Nick DeMuth. With only 1 minutes, 24 seconds left in the second period, Fust scored the first of his two goals, when he one-timed a rebound past Palmquist to tie the game 2-2. He did not wait to long into the third to get his second, just 23 seconds in, Fust was able to get a wrist shot off that deflected off a Packers' defenseman and fluttered over the shoulder of Palmquist for the eventual game-winner. Roo tallied a power play goal late in the third, deflected a perfect pass by Fust from the point that slid underneath Palmquist to finish the scoring and give Totino-Grace a 4-2 win. With the victory, the No. 2 Eagles will play No. 1 seed St. Thomas Academy 7 p.m., Friday March 4 at Aldrich Arena with a trip to the state tournament on the line. Check back later tonight for game recaps, feature and three stars. Two goals, including the game-winner gives him the top star tonight. His goals were timely, because one gave the Eagles going into the locker room, the other gave them momentumm for the rest of the third period. He also had an assist on Roo's goal. Roo assisted on both Fust's goals and put away a power play tally of his own to add some much needed insurance for the Eagles. He tipped in a perfect pass to eliminate any chance of a comeback by South St. Paul. It is not often that ou let in four goals and get a star, but Palmquist is well deserving. He made 41 saves, most in heavy traffic where he had to dive and flop around to keep South St. Paul in the game. See which picture was voted as the best from our coverage this year.